Two Boston College science professors—Dunwei Wang, assistant professor of chemistry, and Stephen Wilson, assistant professor of physics—were recently awarded five-year career development grants by the National Science Foundation to support their research. Wilson, who arrived at Boston College in January 2010, will receive $620,000 to further his study of electron behavior in new classes of materials. Wang, a member of the chemistry department since 2007, will receive $550,000 to support his work in clean energy technologies, particularly solar and hydrogen power systems. 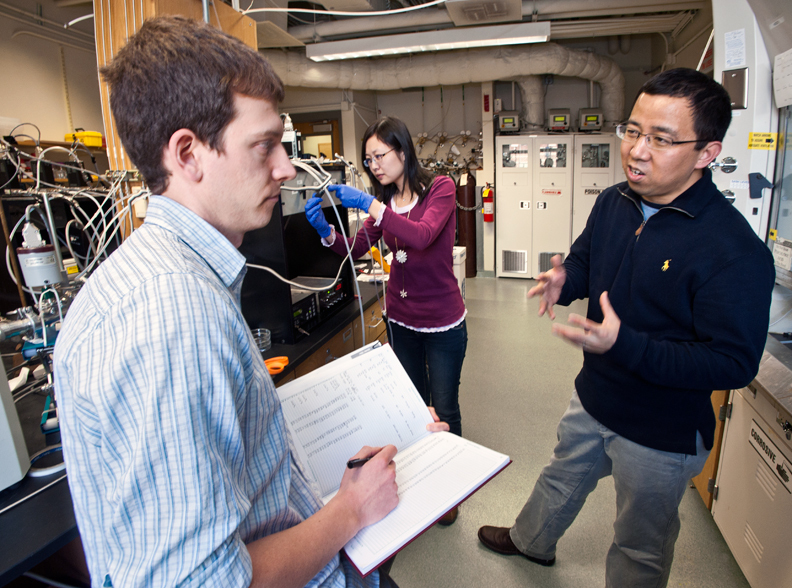 On January 31, Wang (above, right) worked in his Merkert Chemistry Center laboratory with chemistry Ph.D. students Matthew Mayer and Sa Zhou. This feature was posted on Thursday, February 3, 2011 and is filed under Featured Photo.